Bread rolls are a perfect kids lunch box recipe. Bread rolls are easy to make and bread rolls are good to serve as a party snack. 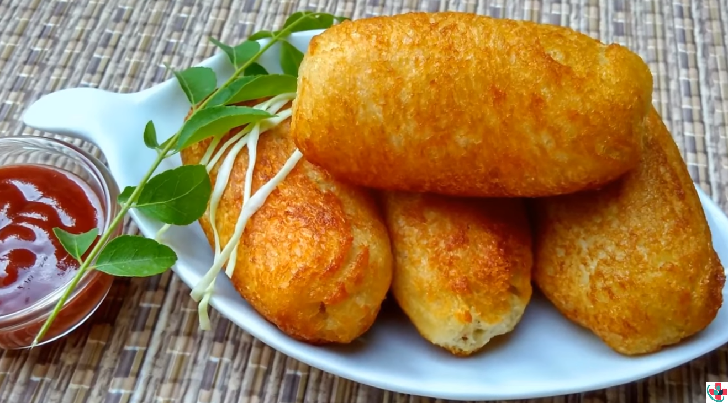 I hope you'll like this bread roll recipe. ⏩Heat a tsp. oil in a pan, add ginger garlic green chili paste sauté for a minute remove from heat. ⏩In a bowl mix boiled and mashed potatoes, the sautéed ginger garlic green chili paste red chili powder coriander seed powder cumin seed powder garam masala powder chaat masala and salt. ⏩Add a handful of chopped coriander leaves mix everything well and make small balls and shape them 3 inches long. ⏩Cut the edges of bread slices then wet the slices a bit do not immerse them completely in water they become soggy very fast and then will be difficult to handle. ⏩Then press gently between palms so that all excess water is drained off. ⏩Then place the potato ball on the edge of bread slice roll it from one end to other and seal the edges properly as we have wet the bread slices it will stick fast. ⏩Press and roll between palms gently to make rolls. ⏩Mix 1 tbsp. corn flour with half cup of water. ⏩Dip the bread rolls 1 at a time into the corn flour batter that ways the rolls will not soak much oil if you deep fry them directly they soak a lot of oil. ⏩Then deep fry them in medium hot oil till brown.